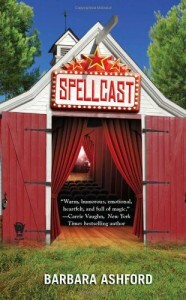 One of the things I love best about blogging is discovering books like Spellcast. This is one of those books that I would have passed right over if it hadn't been for the tweets that Jessica from The Spinecracker saying how much she loved this book. As we have similar tastes in books, I went to goodreads to check it out. I'm not sure what drew me to the book, but I decided to take a chance on it-and I'm glad I did. Words really can't describe this book. It's sweet, fun, lovable and full of goodness. I love being thrown for a loop, and in all honesty I didn't see the direction this book was taking until it was it was too late. I really thought I had the ending all figured out, and then was like "wow." Didn't see that coming at all. I truly love it when that happens. Maggie is one of those heroines who you just love right off the bat. She's a New Yorker, and while she may be down she certainly isn't out. She loses her job and her apartment literally caves in on her all in the same day-and she uses that as an excuse to get away for the weekend. She's not sure where she's going, but she finds herself in Vermont, in a small town that she's not quite sure what to make of. She's always loved theater, but caved into her moms plans for her and went into business instead. When Maggie arrives in the small town of Dale, she just wants a cup of coffee and a place to stay for the night. Life has other plans for her. The women running the coffee shop assumes she's there for theater tryouts and holds her coffee hostage and tells her to go and tryout. The theater is in an old barn, and there is just something different about the people in charge-she just can't quite put her finger on what makes them different. She auditions , and is disappointed when she doesn't get the part she wanted in any of the plays they will be performing. She's really disappointed when she's the only there with any acting experience, and still didn't get any of the main roles. She's intrigued though by everything about the theater to the small town, so she stays and ends up finding more about herself and those around her then she had planned. The entire cast of characters is just wonderful, and I found myself in love with all of them. Everyone can learn something from this gem of a book. It's funny-this is the book that started me on a string of wonderful reads, (I read it in the beginning of May) but I found it really hard to review for some reason. It's one of those books that is unassuming and you find yourself pulled into the world that Barbara Ashford created before you know what happened to you. Spellcast has romance in it, but it's a combination of fantasy, contemporary romance and paranormal romance. All I have to say is try it and discover something wonderful. Again, a big thank you to Jessica because this is a book I would have passed over without her enthusiastic tweets about it.